As all of you know, Tanki Online started its journey in 2008. Right from the start it was decided that the game would be based on Flash. Firstly, it was a convenient tool that had many built-in features. Secondly, Flash was extremely popular, 99% of PCs had it installed. Another important thing was the fact that key programmers of the company had been working with Flash for a lot of time before, we knew the technology and there was no risk of pitfalls. We knew that we could develop a Flash game that would work in real 3D. A game that would work smoothly on basically any PC and wouldn’t require any installations. Just open a browser, and there you are, playing. It was decided that the game would be based on an in-house development, Alternativa3D engine. Other technologies available at the time simply didn’t meet our requirements. In the meantime, Alternativa3D was very productive for its time and provided correct sorting of polygons, which was a serious issue at that moment. Moreover, it was able to provide players with decent graphics without hardware acceleration. The engine was constantly developing, there were several versions of it, the most important of them are Alternativa3D 3, 5 and 7. 3rd and 5th versions weren’t widely used, just for some technical demos. Interestingly, AlternativaEditor is based on Alternativa3D 5, while Tanki Online uses Alternativa3D 7. Interestingly, many years ago we were thinking of moving to Unity which had a lot better performance than Flash at that time. However, after some time Adobe released 3D API Molehill that allowed the use of GPUs to process graphics in Flash games. The performance issue was solved. Moreover, Unity was almost unavailable in browsers, so it was decided to stick to Flash. 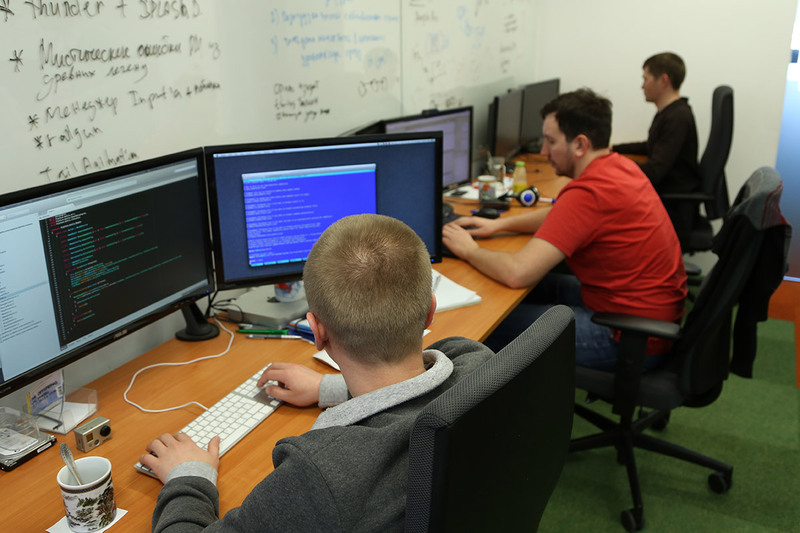 One of several teams of programmers that is focused on working with Unity. And now, years later, we’ve decided to move to Unity once again. This is largely due to the fact that we have a new goal ahead of us, creating a global gaming social network. The task is really challenging and time-consuming. It was decided to develop the new version of Tanki and its graphics on Unity right from the start. The technology is growing rapidly, its creators have a clear strategy of development and follow it. At the same time, Flash is standing still. As a result, we allocate lots of resources to optimizing and tweaking the content. We are not willing to spend resources on creating solutions from scratch. — Technologies that Unity provides allow us to implement the new graphics and adapt it for both PCs and mobile devices. Unity is conquering the world. More and more game studios create their new games on Unity. Before deciding to move to Unity we analyzed our audience and found out that 43% of our players already have Unity installed on their PCs which is a lot. A lot remains to be done but we get closer and closer to the target with every day. Currently we are developing the following components of the game: server platform, combat mechanisms, the game’s interface and graphics. Stay tuned for more news about the process of development!